Grammy-award winning producer, songwriter and musician John McEuen has just announced his plans to release his sixth solo album titled Made In Brooklyn with Chesky Records. The 16-track collection of signature originals and songs from yesteryear was created in similar fashion to the landmark Will The Circle Be Unbroken and will appeal to all genres and all generations. Made In Brooklyn is scheduled for a release on 30th Sep., 2016. With the Circle projects, my brother Bill’s production method put all the players in a circle, with all the mics mixed live to two tracks. The highest quality method at the time. It made listeners feel like they were sitting in the front row of a small concert. The Chesky technology utilises just one special binaural mic and the performers circle around it; the listener feels like they’re in the band – John McEuen. Made In Brooklyn, part of Chesky’s Binaural + Series, is poised to rank among the audiophiles’ top “must-have” recordings. Borrowing from an old-fashioned, live production method, all musicians were strategically positioned in a reverberant church (in Brooklyn, NY) for a single-pass recording. The live performances were captured in high-resolution (24-bit/192kHz) with the single “Dummy Head” microphone system, affectionately named “LARS.” (Lars’ ear microphones are specially calibrated to recreate the spatial characteristics of human hearing to offer a spacious, lush and multi-dimensional listening experience). Put on a set of headphones and you’ll hear the three-dimensional sound Chesky recordings have become known for. Made In Brooklyn is exquisite; you’ll hear some of the most natural and pure cool music ever recorded. We’re extremely proud of John’s project as an example of musical perfection with the binaural process – Norman Chesky, President of Chesky Records. 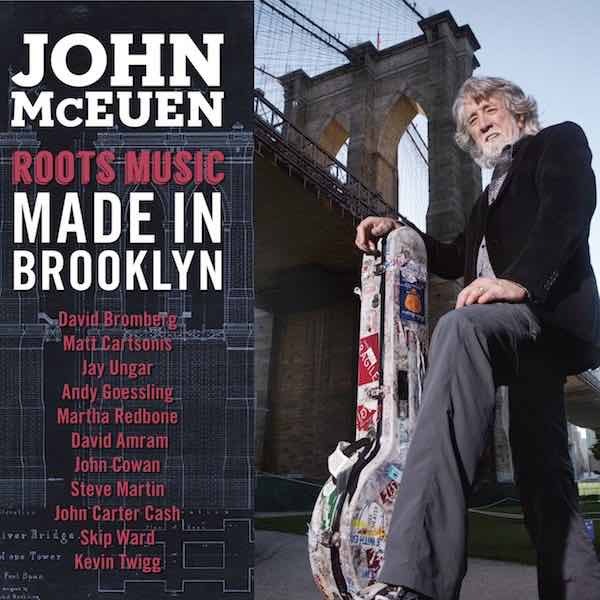 Just as the Circle album reached across lines of acoustic, Bluegrass and country, and appealed to folks from all walks of life, I believeMade In Brooklyn will too – John McEuen. Made in Brooklyn will be available from 30th September 2016 via all major digital retail outlets and HD Tracks. Pre-sale begins 26th August 2016; purchasers who take advantage of the pre-order, will receive “Excitable Boy” as an instant gratification track. Over the course of his 50-year career, multi-instrumental “String Wizard,” John McEuen has performed more than 9,500 concerts, covering more than three million miles globally with the Nitty Gritty Dirt Band and as a solo performer. McEuen has recorded over 40 albums (6 solo)–four platinum and five gold–garnering awards that include Grammys, Emmy nominations, CMA and ACM awards and IBMA Record of the Year honours. As a musician, McEuen has built a lasting legacy including his seminal work on the Will the Circle Be Unbroken album, recognised as “the most important record to come out of Nashville” (Rolling Stone) and “the most important record in country music” (2004 ZAGAT survey).